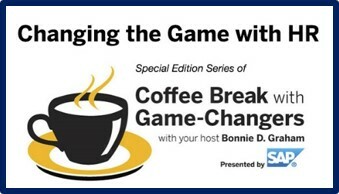 This show is part of an 8-episode SAP SuccessFactors radio series that started on January 19 and will continue to air every three weeks on Thursdays at 11 AM PT / 2 PM ET on the VoiceAmerica network Business Channel, SAP Radio Changing the Game with HR. The series will run through August 2017. All shows will be recorded and available for download or live playing via the website. Our last show aired on June 22, 2017, titled: “From One to Many: HR’s New Focus on Teams, Not Just Individuals” is available here. This century has brought forth a new era focused on social responsibility for business leaders. More than turning profits and producing great products, leaders are expected to have a moral compass. That moral compass becomes more than part of the corporate brand and its culture; it becomes a company’s statement about its role as a ‘citizen’ of the world. Prospective consumers, employees, partners, investors, and influencers weigh a company’s ability to take a stand and invest in the communities in which it serves as an indicator of that company’s commitment to making the world a better place. From investing in cancer research to building homes and industry in emerging economies (and everything in between), corporate social responsibility programs that engage the workforce and influence community investment have become a key indicator of brand equity and the value a company holds in the world. One topic that corporate leaders can directly impact is that of raising awareness and money to combat disease. For example, lung cancer is the number one cancer killer of Americans with the highest rates in the African American population. The lack of early detection and empathy – lung cancer has a stigma – gives lung cancer lethal power. Despite the staggering numbers associated with lung cancer diagnosis and prognosis, research for a cure, early detection, and education have been largely under-funded. Corporate CSR programs can make a big impact by encouraging members of the workforce, who have been directly or indirectly impacted by the disease, to join a corporate-sponsored platform to raise funds and awareness. With the right backing from leaders, a corporate platform becomes the foundation for a movement enabled, unified and directed by the people.